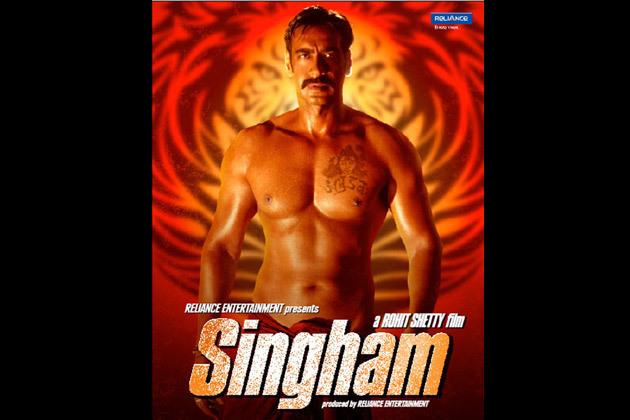 A few minutes into 'Singham', Ajay Devgan emerges from a holy lake, dressed only in a red dhoti and flaunting his pumped-up physique. He walks into camera in slow motion, his torso still wet, that six-pack visible from as far as the Moon. This 80s-style actioner sees Devgan star as Bajirao 'Singham', an upright cop in a small village on the outskirts of Goa who dispenses his own unique brand of justice, which includes leaping in the air and landing a hard whack on the head of a local eve-teaser, or using his belt to wallop the living daylights out of the villain's henchmen. His nemesis in the film is an evil Mafioso and corrupt politician Jaykant Shikre, played by the superb Prakash Raj who delivers a deliciously over-the-top performance marked by clap-trap lines and hyperactive dialogue delivery. The flimsy plot involves the cop's tireless crusade against corruption, which sees him clashing with seniors in the establishment who're determined to get him off Shikre's back. There's an obligatory romantic track between Devgan's character and newcomer Kaajal Aggarwal, but the film's strength lies in the combustible chemistry between Devgan and Raj. Despite some nifty action sequences - including one in which Devgan plucks a bad guy out of a car as it hurtles over his head - 'Singham' wears you out over the course of its 2 hours and 30 minutes running time because it all seems so darned familiar. In Devgan's character, director Rohit Shetty offers his own take on the Angry Young Man, and even throws in a reference to that iconic "don't-sit-until-you've-been-asked-to-sit" scene from Amitabh Bachchan's 'Zanjeer'. But alas 'Singham' doesn't have the smarts of a Salim-Javed script. It offers a routine 'why-most-cops-are-corrupt' subplot, and comes loaded with such corny lines as "Meri zaroorat kam hai, issliye mere zameer mein dum hai!" Remake of the 2010 Tamil blockbuster of the same name, 'Singham' has occasional bursts of comedy (both puerile and genuinely funny), but it's never quite as entertaining as the similarly intentioned 'Dabangg'. 'Singham' isn't an unwatchable film, but how many times can you watch bad guys being whipped with a belt? Or heads being pummeled by a bare fist? There is such a thing as overkill, after all. I'm going with two out of five for director Rohit Shetty's 'Singham'. I suspect it's going to make a load of money; I only wish it was a better film. Ajay Devgan fans won't be disappointed.